The Controls tab is where you view and edit what the controls do. 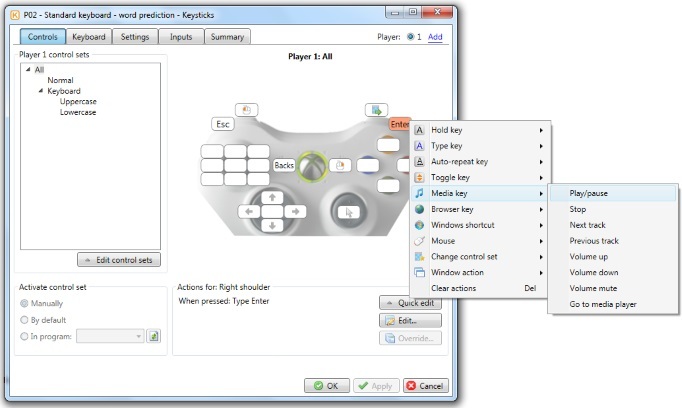 The controller image shows the controls for the control set selected on the left. When you click a control, a description of the actions assigned to it is shown in the "Actions for" frame at the bottom. You can also hover the mouse over the controls to see a short description of what they do. You can quickly assign actions to the controls by right-clicking them and choosing one of the ready-made templates (see picture above). Alternatively, you can use the "Quick edit" button, which does the same thing. If you don't find what you want on the right-click menu, you can click "Edit" and add your own actions. There's also an "Override" button. This is for advanced situations when you have defined some actions in a higher-level control set (e.g. "All") but you want them to do something different in a lower-level control set. You can drag and drop to quickly move actions from one control to another. Note that the actions won't be moved if the destination control has an incompatible type or "directionality" (see Profile Designer - Settings for an explanation of directionality). For example, you can only move a "Control the pointer" action to a stick control with "Continuous" directionality. Take care when moving actions that are "inherited" from a parent control set because moving these will affect all control sets beneath that parent level. On the left-hand side, you see a hierarchical view of the control sets for the selected player. Each control set defines one set of controls that can apply to your controller at a given time. By creating multiple control sets and switching between them, you can change the controls dynamically. When you select a control set, you see its controls on the right-hand side. You can see that the top control set is called "All". Select this when you want to define controls that stay the same (while the profile is loaded). 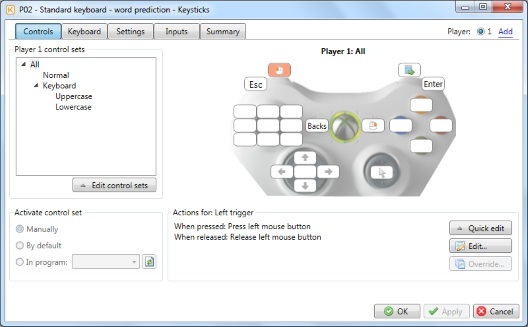 For example, in this profile ("P02 - Standard keyboard - word prediction"), the left trigger always performs a left mouse-click. Beneath "All", we see two main control sets, Normal and Keyboard, and the Keyboard control set is further sub-divided into two pages of controls: Uppercase and Lowercase. 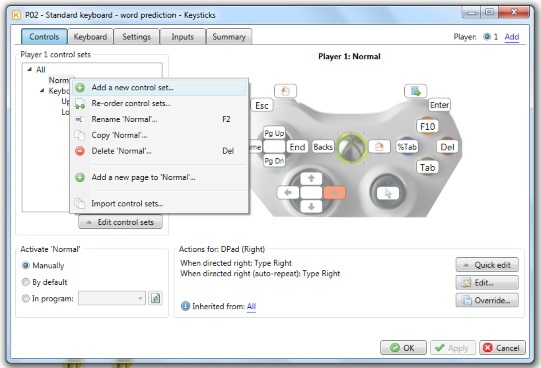 In this example, the Normal control set defines some general controls for using Windows and the Keyboard control set defines controls for typing using the Keysticks screen keyboard. A "Change control set" action is assigned to the right trigger, which allows us to manually switch between the control sets when we want to show or hide the screen keyboard. It's also possible to make Keysticks activate a control set automatically when you switch to a particular program. For example, you can make Keysticks activate/deactivate the controls for a game when you activate/deactivate the game window, without needing to press anything. To do this, select the control set containing your game controls, select the "In program:" option in the 'Activate...' frame, then select your game from the drop down list. (The game needs to be running to appear in the list. If it isn't, start it then click the refresh button next to the drop down menu, or type the game's process name if you know it.) To specify another control set to switch back to when you leave the game window, select that control set then click the "Default" option in the "Activate..." frame. To illustrate this idea, the picture below shows some settings that automatically open and close the screen keyboard when you switch to and from the WordPad program. You can add, edit and delete control sets and control set pages by right-clicking them, or by selecting the "Edit control sets" button. You can also import control sets from another player or profile if you want to reuse ones you've previously created. In previous versions of Keysticks, you added keyboard controls at the same time as adding a control set. Now you first add the control set then you select 'Add a keyboard' on the Keyboard tab. When you apply a profile, Keysticks activates the controls in the first control set (in this example, "Normal"). You can change the order of the control sets by selecting "Re-order control sets" from the right-click menu.